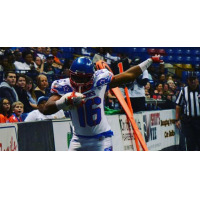 JACKSONVILLE - The Jacksonville Sharks have announced today that they have signed Wide Receiver Chad Walcott (6'2, 212) for his fourth season of arena football. Walcott started his arena career with the Triangle Torch of the Supreme Indoor Football league in 2016 where he scored 12 touchdowns as a rookie. Walcott returned to the Torch in 2017 for his second year in arena football. During that time, he racked up 18 touchdowns in seven games and made the SIF All-Star selection list as well as being named the 2017 Supreme Indoor Football Offensive MVP. Last season. During his third season, he played for the Cape Fear Heroes of the newly formed American Arena League (AAL). Walcott, finished the 2018 season helping the Cape Fear Heroes to a AAL Semifinals game appearance. In addition, Walcott was honored as a 2018 AAL All-Star and played in the AAL's All-Star game.